Until recently, dairy farmers have been hindered in their ability to quickly detect possible reasons for a reduction in milk production among their herds. One reason might be sub-clinical ketosis (SCK) when an affected cow appears to be well and only becomes observably distressed when SCK becomes full ketosis and affects major organs; or it might be another metabolic disease. The only true method of detecting these abnormalities was by taking vials of the affected cow’s blood and sending samples to a lab for diagnosis. However, the BioNano Laboratory of the School of Engineering, University of Guelph, has advanced this procedure by developing a device which puts the ability to diagnose a cow’s health in the hands of farmers themselves. This can save crucial time in detecting certain bovine metabolic irregularities, and thereby providing earlier treatment. By detecting certain enzymes in blood, this new device can pick out these biomarkers present in miniscule amounts and help identify diseases. A combination of a unique composition of electrodes, a plant enzyme, and the correct amount of electric current were discovered by the BioNano research team to be the winning formula used collectively in the device known as a “Gryphsens”. 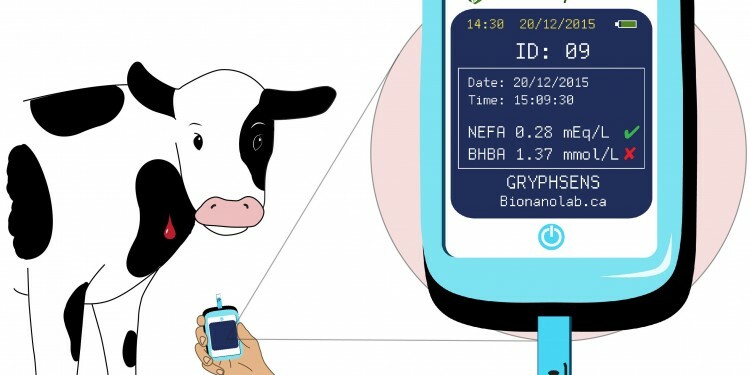 Through a handheld sensor, a dairy farmer can rapidly detect whether a cow has sub-clinical ketosis or other metabolic diseases by taking a small amount of blood and having the sample analyzed in real-time through the Internet via a smart phone. Such technology not only allows a dairy farmer to rapidly determine a cause for a reduction in milk production, but it also allows early detection of metabolic diseases that can then be treated, facilitating a cow to return to its normal milk volume levels in a shorter period of time. The cost saving of such early detection is substantial for small and larger dairy herds. This Canadian invention that uses a unique electrochemical measurement of samples can be engineered for use with in-line robotic milking machines to monitor a herd individually, yet collectively, to avoid the repetitive and time-consuming method of testing each cow separately. 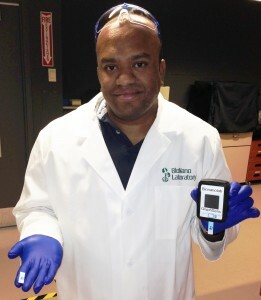 The sensor, developed by a team headed by Dr. Suresh Neethirajan, is able to detect minute electrochemical activity in biological fluids that indicate biomarkers for certain irregularities and diseases. These markers flag slightly elevated levels of non-esterified fatty acids (NEFA), and a ketone prevalent in cows, β-hydroxybutyrate (BHBA), that at higher levels can both signal the early onset of ketosis and other metabolic diseases. Historically, the calving period is a stressful time for cows, described as a time of negative energy balance (NEB), when the onset of ketosis or other metabolic diseases are most prominent. Although the levels of NEFA and BHBA are miniscule at the beginning, early detection can reduce complications and a faster recuperation period. Later detection could lead to fatty liver, ketosis, displaced abomasum (twisted stomach), and inflammation of the uterus or a retained placenta. Dairy farmers are highly cognizant that charting a cow’s NEFA and BHBA levels is the litmus test for the animal’s overall health. One of the great advantages of testing for on-farm dairy cow diseases is that it not only significantly reduces the stress on the animals, but also provides instant test results. 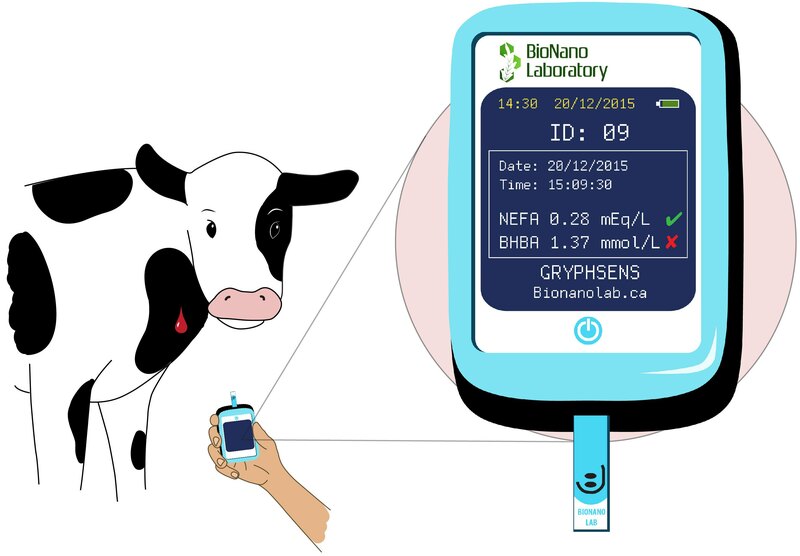 Although there are similar devices for measuring human glucose levels for diabetes, the cow’s organism presents a further challenge by having 11 major blood groups versus four. The challenge was developing the sensor’s electrode that could simultaneously detect both NEFA and BHBA in variable metabolic conditions that can include a number of interfering components which could alter the test results. Ability to detect multiple disease biomarkers from just a droplet of blood sample that could be used by untrained farmers is unique. Disposable screen-printed carbon electrodes (SPE) were chosen for their affordability and for their compatibility with handheld and in-line robotic milking devices. From previous discoveries, the compounds used on the electrodes favoured redox active hybrid graphene oxide (GO) materials that have proven very effective in biochemical applications. In order for this application to identify NEFA and BHBA, electrodes incorporating soybean based enzyme were layered on the GO material. This proved to be the defining chemical for detecting both NEFA and BHBA by having superior and durable redox properties of the critical biomarkers compared to untreated GO electrodes. 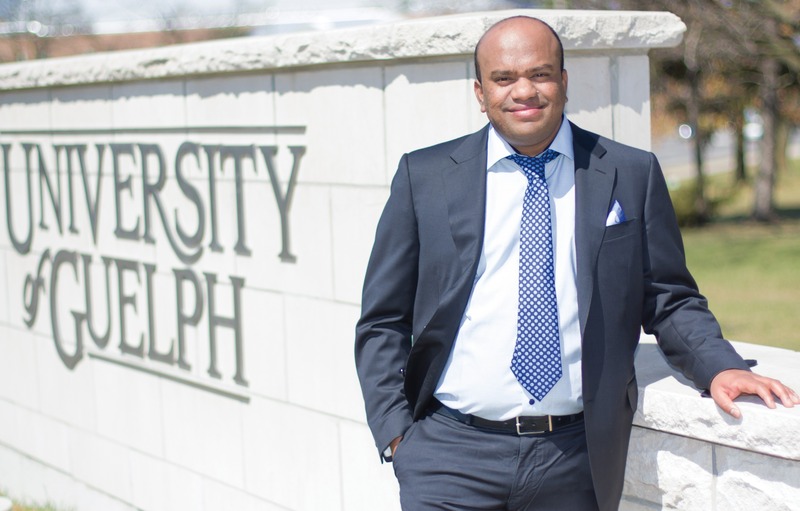 The University of Guelph team found the insulating property of GO hindered the electrochemical function crucial for the biosensor. A particular enzyme from the soybean plant was integral in solving this problem and was incorporated into the dual electrodes. Although lipoxygenase is found in both animal and plant species, using soybean lipoxygenase-1 (SLO) was itself a first for catalyzing direct electrochemical oxidation of NEFA in conjunction with [Ru(bpy)3]2+-GO. In this situation, SLO breaks down the fatty acids found in metabolic lipids to produce fatty acid hydroperoxide. When used in conjunction with electrochemistry, NEFA became oxidized and detectable by the electrode. The sensor’s electrode for detecting the ketone BHBA uses another enzyme (HBDH) that is produced naturally by an organism under stress and is detected through electrochemical oxidation. The isolation to enable it to be detected was engineered through the electrochemical oxidation of coenzyme NAD+ found in organisms to produce NADH. As HBDH is dependent on the coenzyme, the electrode can readily identify the enzyme through covalent bonding of atoms at the molecular level. Dairy cattle are an investment that must be kept in prime condition to maintain optimal production levels, and the Canadian biosensor is the latest tool for dairy farmers and large scale operations. The dual sensor can be an important part of routine screening in the dairy barn. The ease of use and convenience will significantly enhance the management of dairy herd health.